I choose to include flies used in the salt. 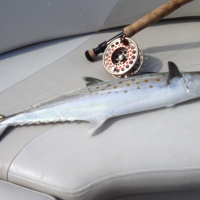 Salt water fly fishing has been around for a while, and seems to be gaining traction. 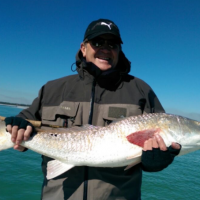 Anglers here in the US are fishing the salt in all the coastal states for a variety of species even sharks. 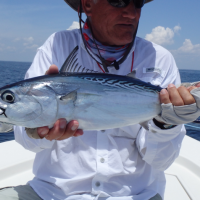 Off shore species are also fished for like Tuna, Sailfish and Marlin. 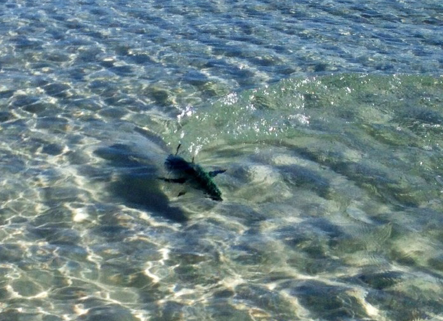 Bonefish are chased on subtropical and tropical flats. 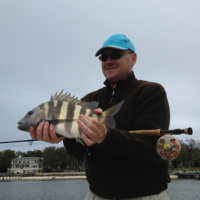 We can catch just about any fish in the upmost water column with a fly. 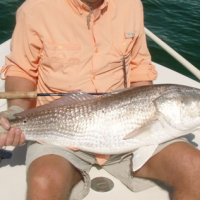 Fly fishing the salt demands long casts, far longer than is required trout fishing. Practice until you easily clear 50-60´ otherwise you are going to have problems in the salt. 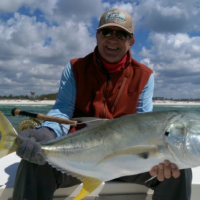 You have tops two opportunities to get your fly to a fast moving salt water fish. They have no holding places, and are constantly on the move. You have to search for them, and blind casting is not productive. Besides the distance you have to master you also have to be fairly quick. Then there is the wind that is always blowing, and there is no shelter. All these considerations demand that you can cast well. It is really very simple to be successful in salt – practice practice practice. The flies in the salt are mainly of the streamer variety. 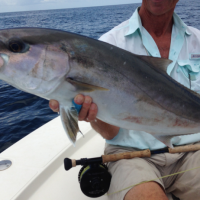 We like to cast something big, and something that could look like a baitfish to the bigger species. We also have some shrimp and crab imitations fished deep to fill up our boxes. 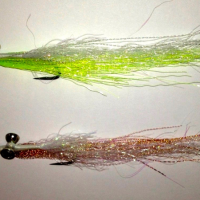 Clousers and Lefty’s Deceiver are the best known salt flies. In the salt we can enjoy success fishing surface flies. 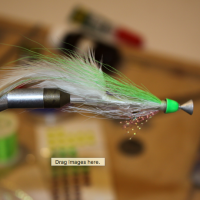 Poppers, Gurglers and Crease flies are used. Fairly big flies that make some commotion when retrieved. When these flies are attacked in the surface you are in for a treat. 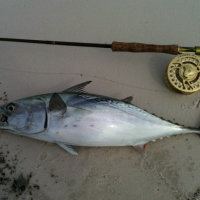 The Poppers make a popping sound when you pull the line hard and short. The Gurglers gurgle when pulled. 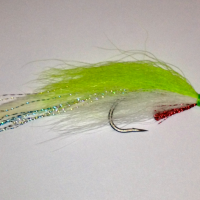 The Crease fly pushes water and disturbs the surface like the Poppers and Gurglers. Big fish will get curious and they check out the commotion. 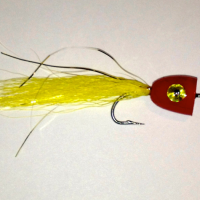 The Clouser Minnow is used by all salt water anglers in various sizes and color combinations. It is weighted with “eyes” tied transversely onto the top of the shank behind the hook eye. It therefore swims “eyes” down and hook up, decreasing snagging. The traditional colors were white and chartreuse. White and any color can work. 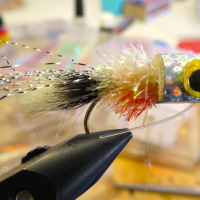 This fly has caught the most different species of fish that I know about, and catches in fresh water too. Lefty’s Deceiver is not far off in usefulness. 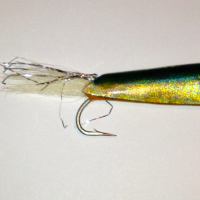 There are many flies mimicking bait, and one such is the Gummy Minnow used for the False Albacore. The tube flies are especially practical in the salt. 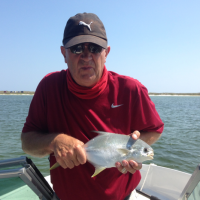 Salt water corrodes metal and the hooks will get destroyed, and that is it for that fly. This is not the case with the tubes where you just change the hook, and can choose to use various hook sizes with your tube. 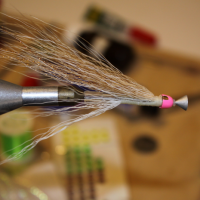 It is easy to make a long but light tube fly, and attach a small short shank hook. 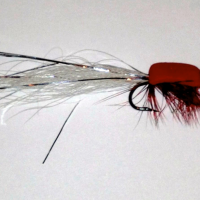 The same fly tied conventionally will be much heavier, and considerably harder to cast, because of the long shank weight. 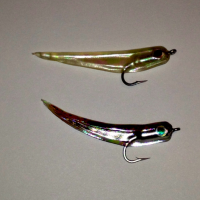 In my opinion it is easier to strip strike to get a solid hook up with a smaller hook than larger. 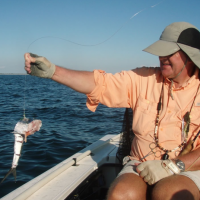 The tubes can be fished in and under the surface, and it is an easy matter to weigh them. I just copy the old standbys onto my tubes. Instead of “eyes” I prefer cones for weight since they have less air resistance, hence easier to cast.